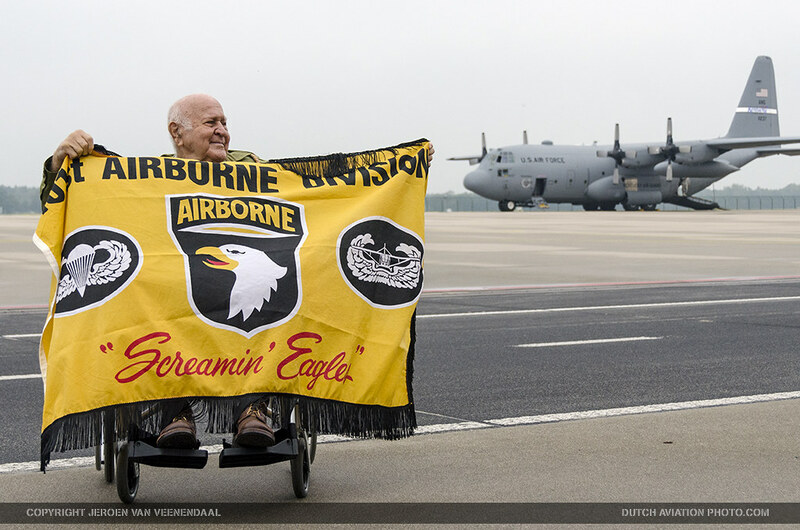 While it may be weird to commemorate a failed operation, it still is the largest airborne operation of all times. 5000 aircraft, and 2500 gliders participated in the airborne part of this operation, code named “Market”. 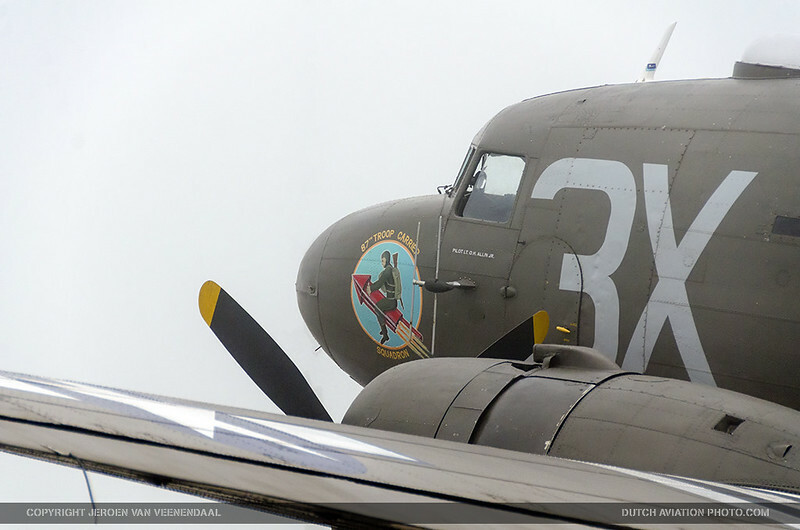 And this year was special, because it was exactly 70 years ago when the operation took place. 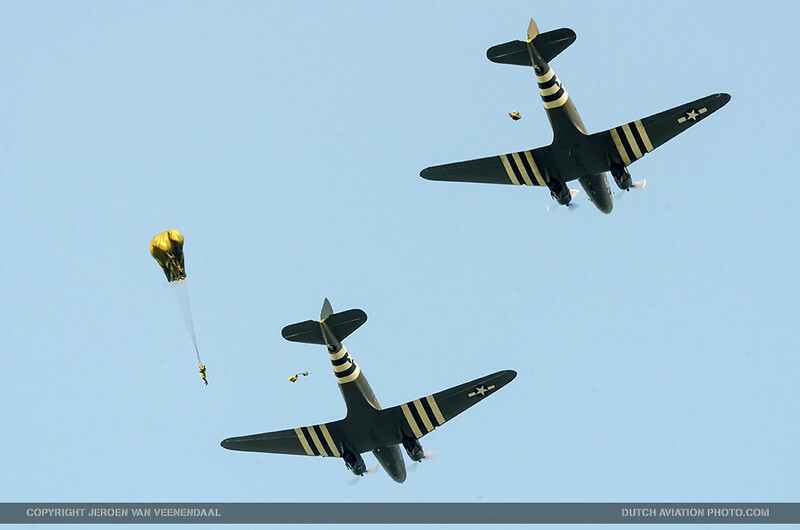 This resulted in more, and larger commemorations in different parts of the south of the Netherlands near the drop zones to replay the capture of the bridges over the many rivers. 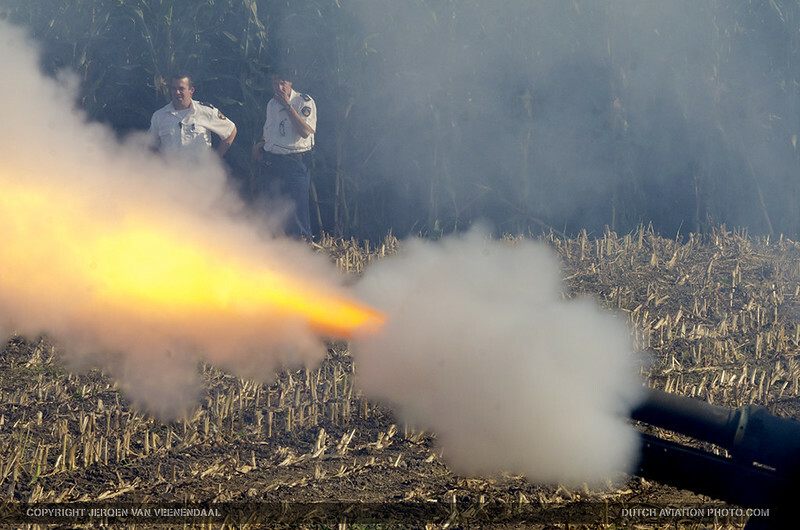 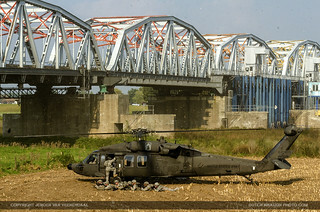 DutchAviationPhoto.com attended the commemoration of the taking of the bridge near Grave over the Meuse (Dutch: Maas) river. 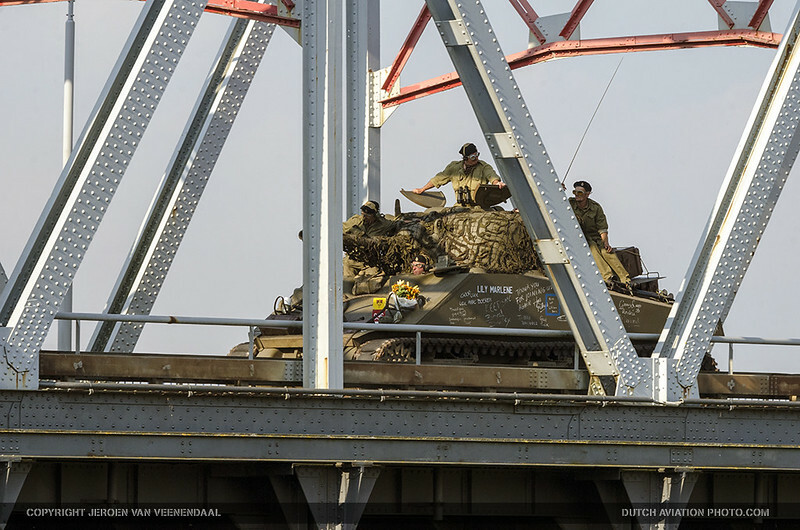 In 1944, the bridge was taken by Airborne troops of the 82nd Airborne “All American” division. 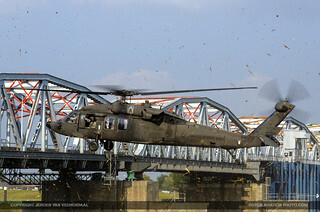 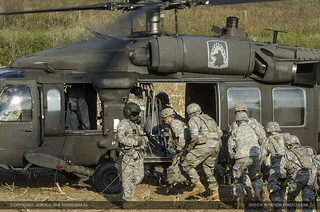 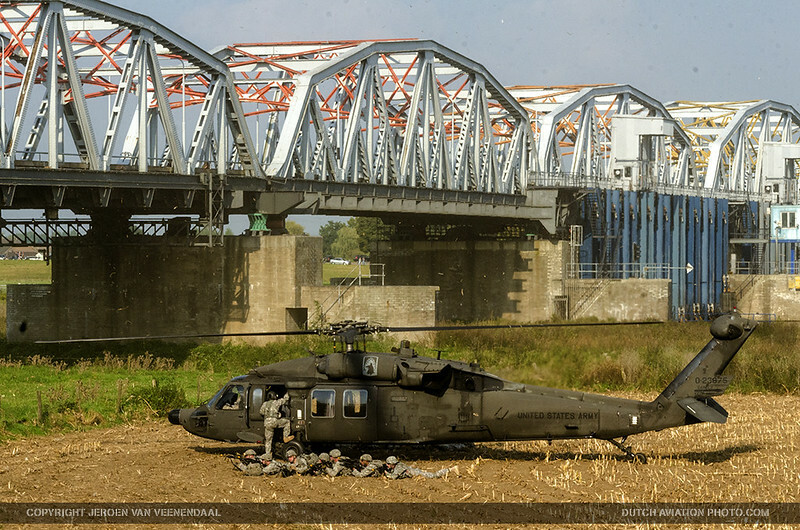 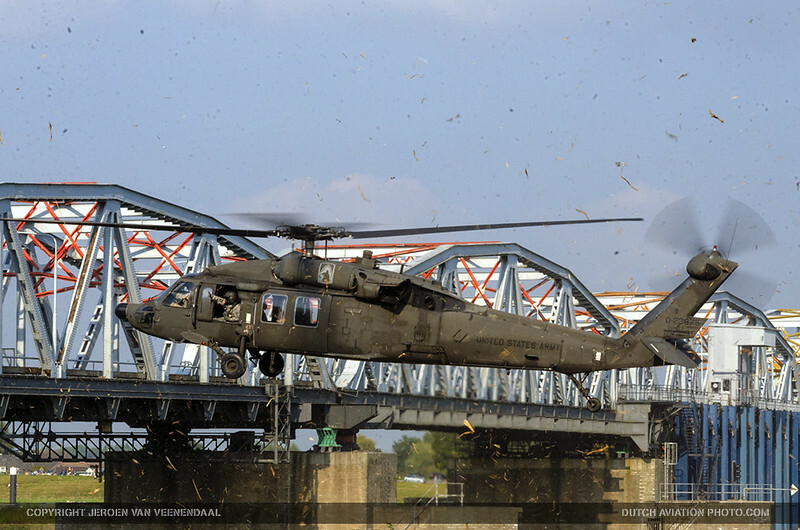 To remember this event, the 82nd Airborne division showed how they would take the bridge in 2014 using Blackhawk helicopters. 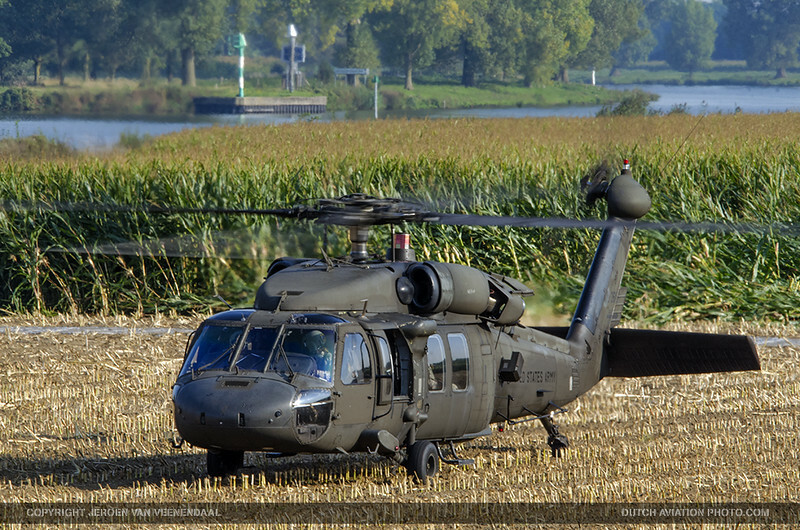 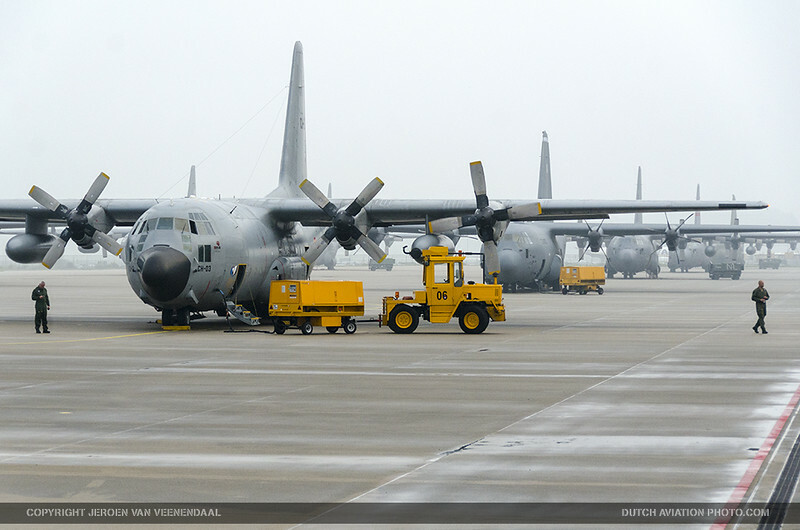 Because these are not a familiar sight in the Netherlands, a lot of aviation enthusiasts were present. 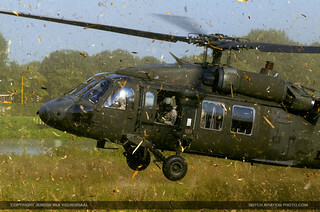 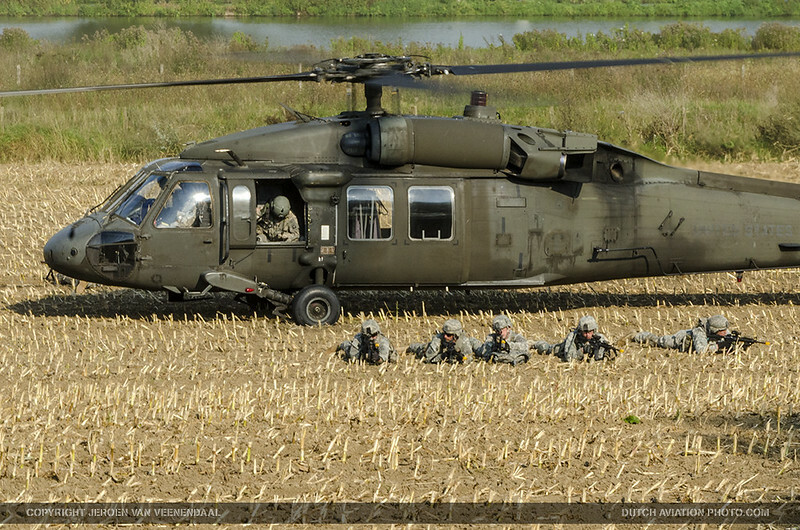 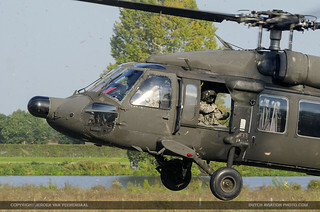 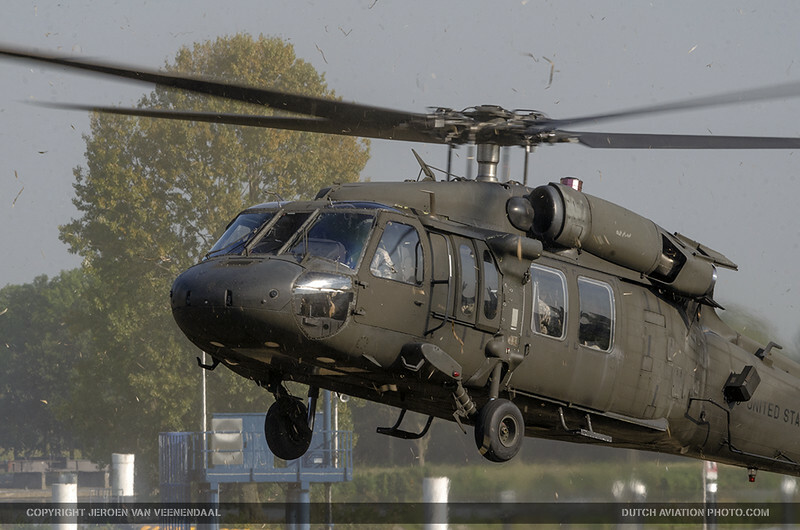 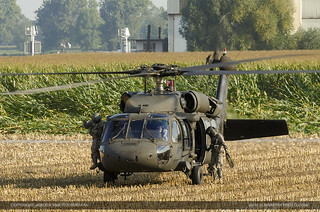 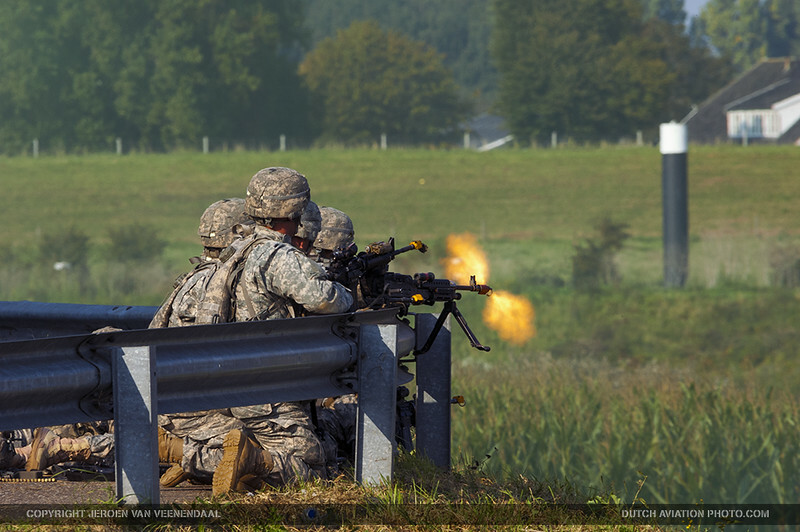 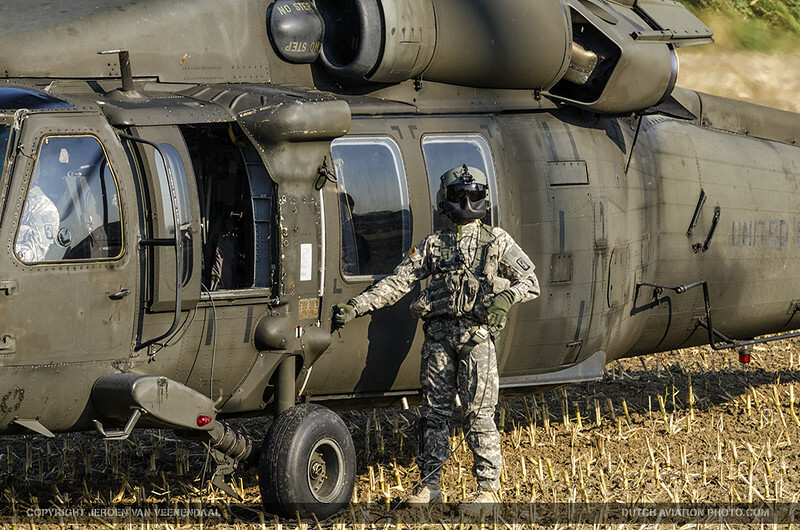 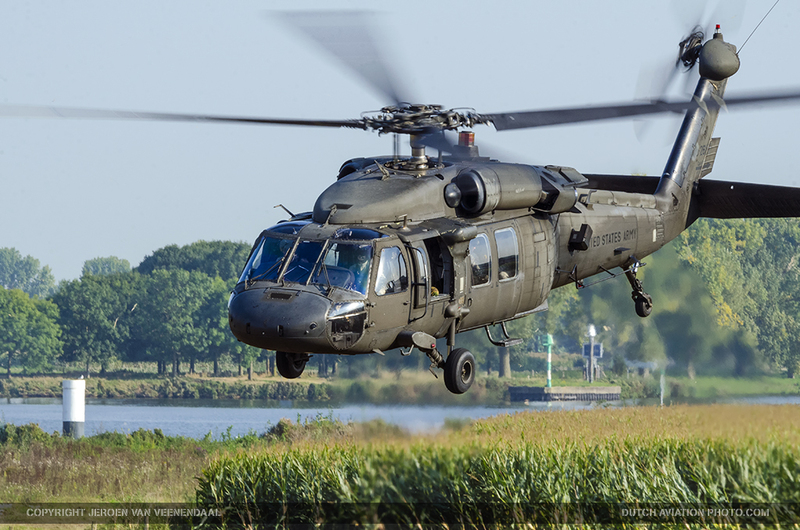 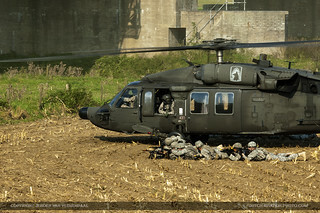 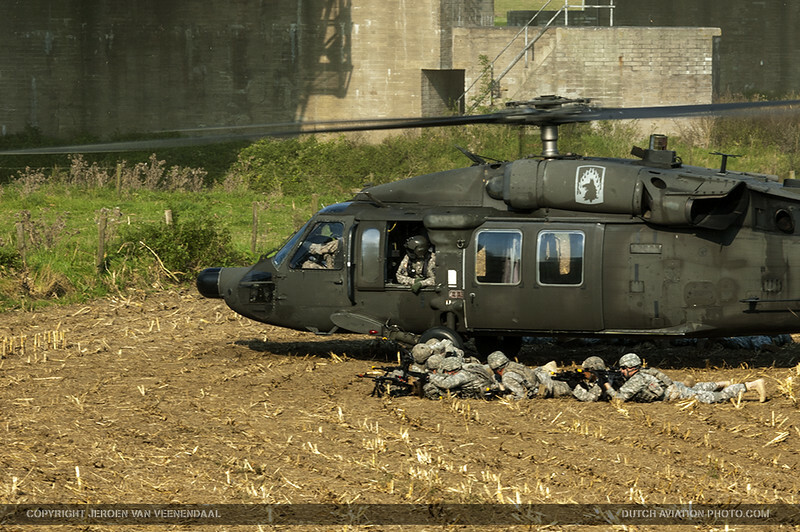 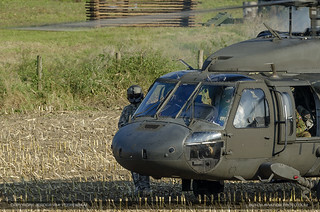 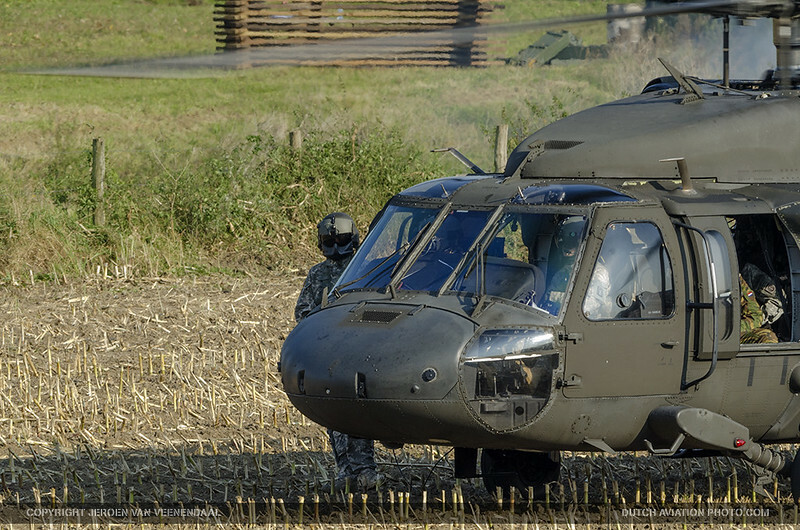 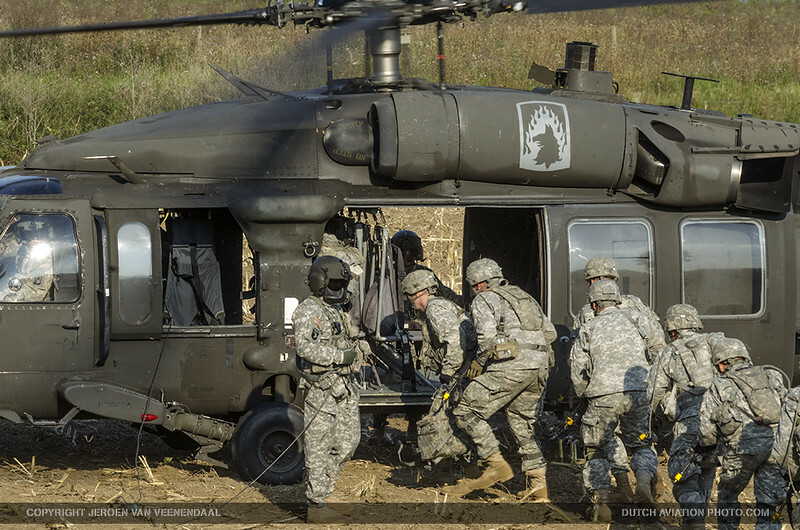 The 5 UH-60A Blackhawk helicopters used for this demonstration are normally stationed in United States Army Garrison Ansbach in Germany. 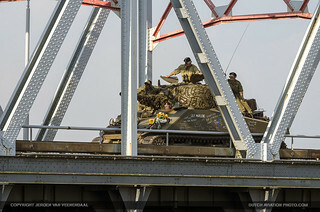 After a short “firefight” the bridge was taken, and the way was clear for a small convoy of WWII tanks to drive over it. After this there was a small para dropping from 2 Dakota’s on the other side of the bridge, over the original drop zone. 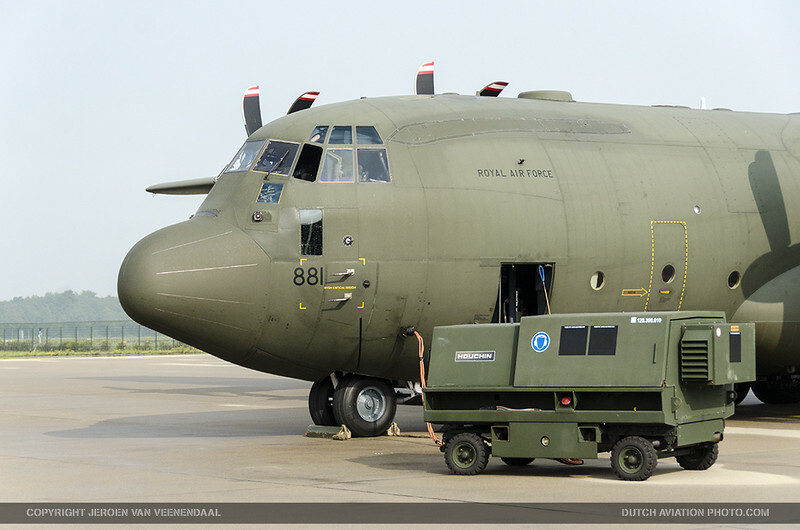 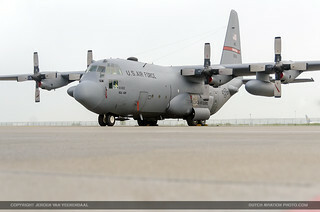 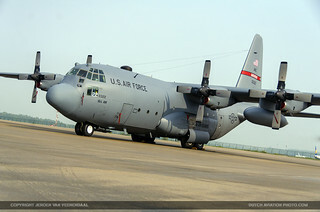 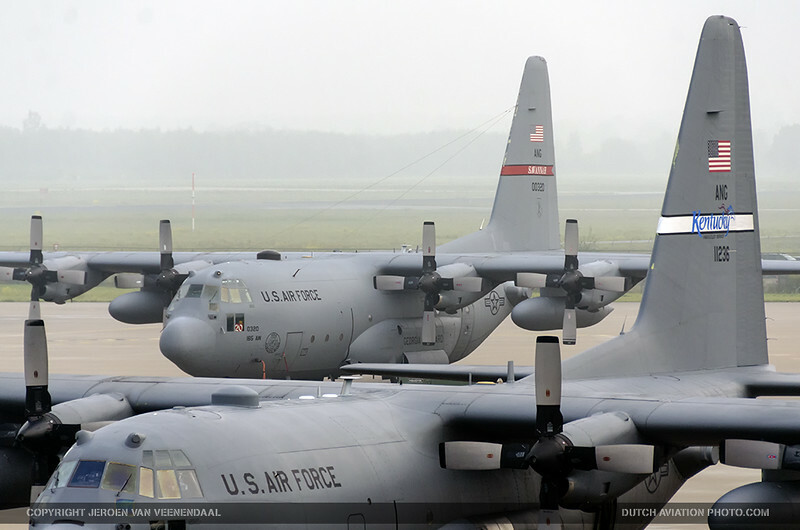 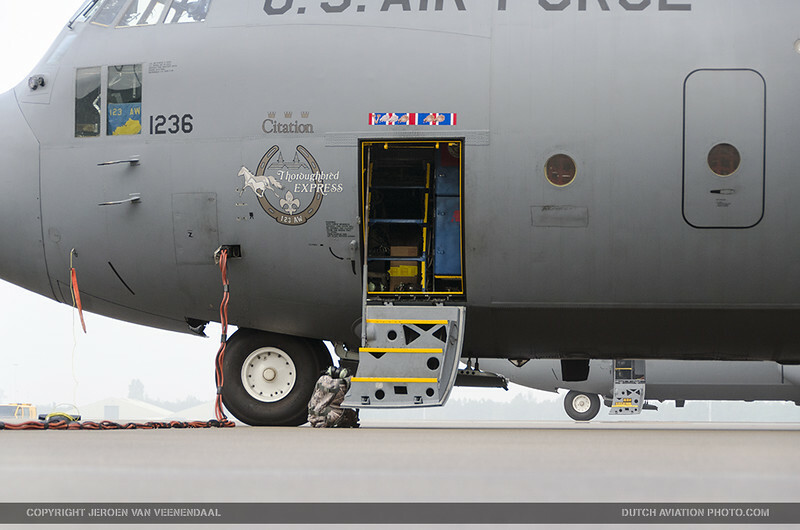 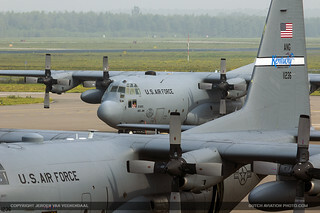 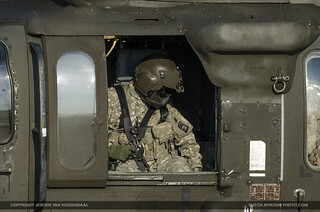 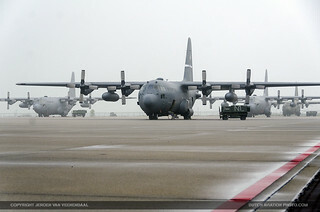 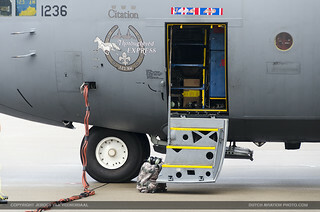 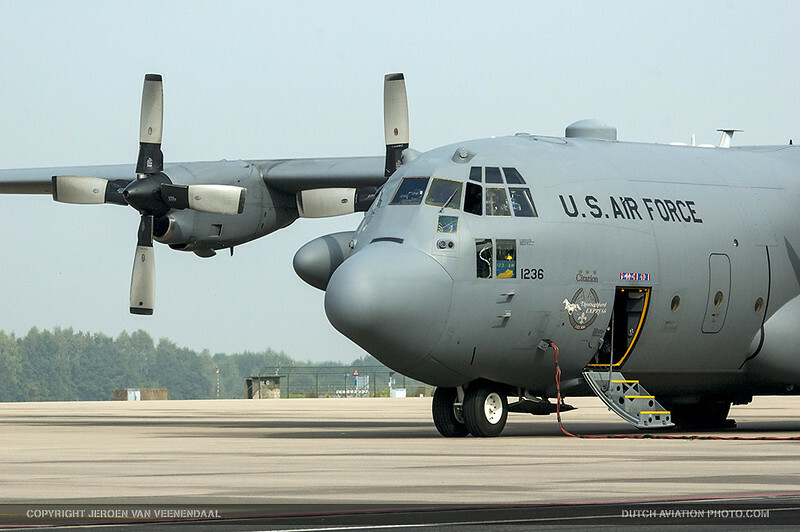 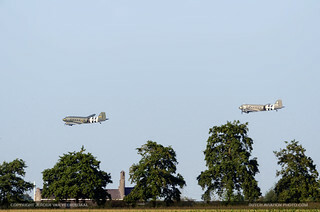 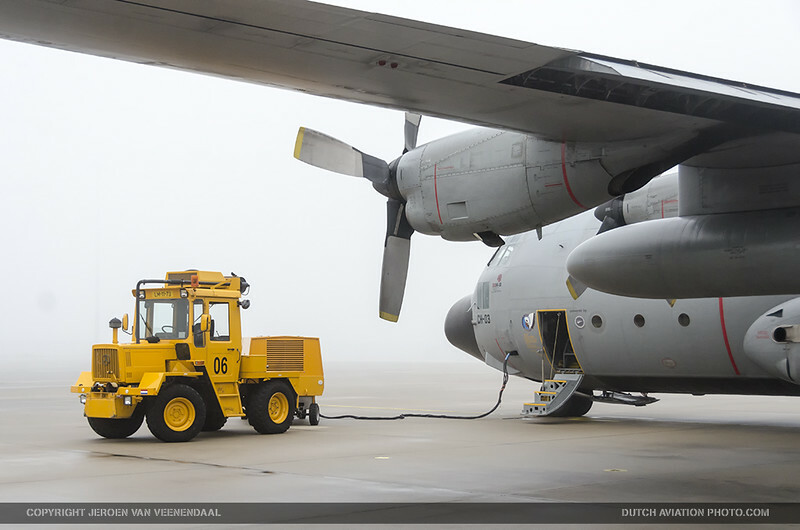 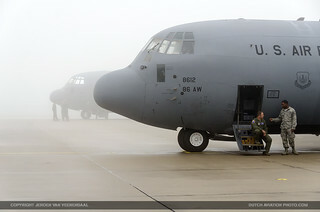 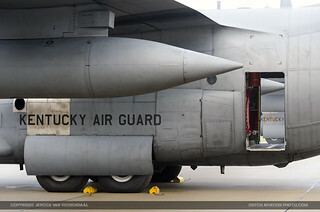 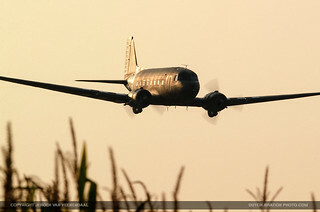 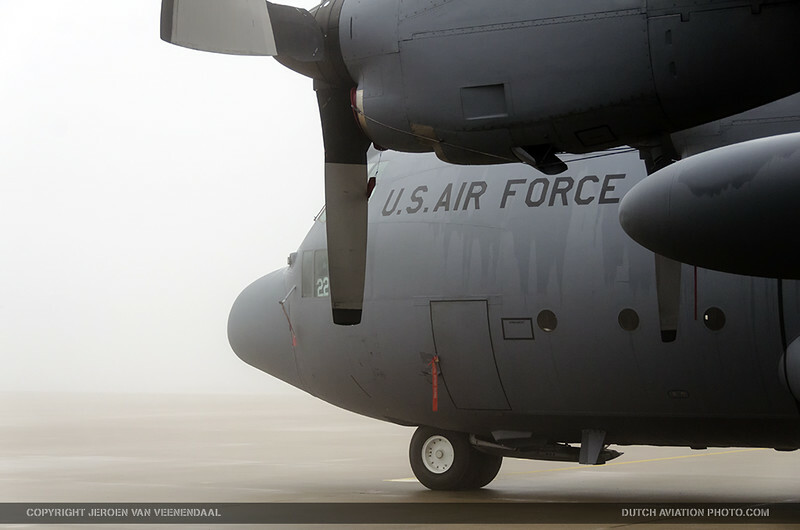 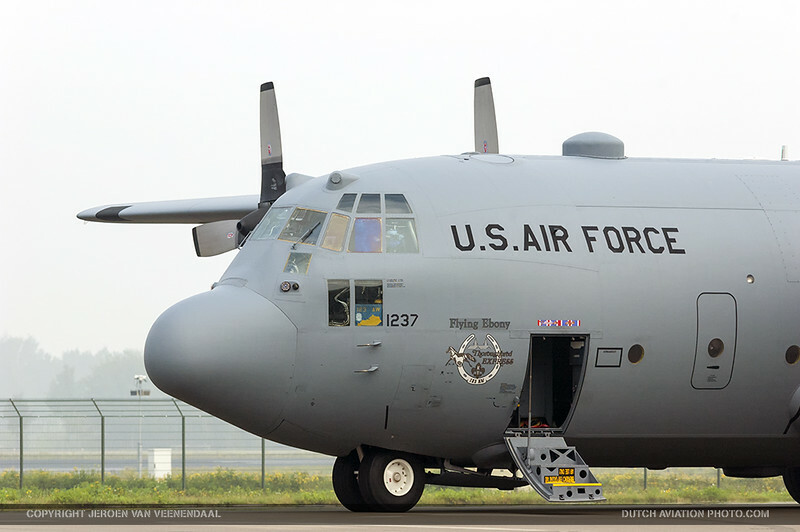 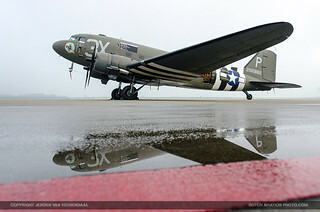 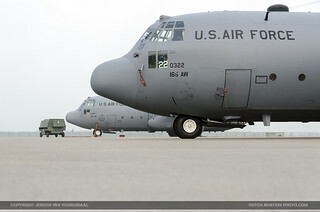 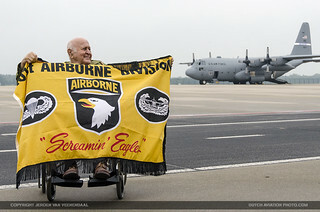 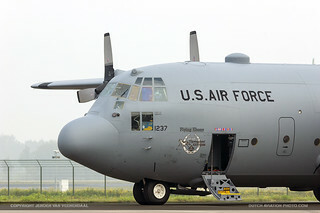 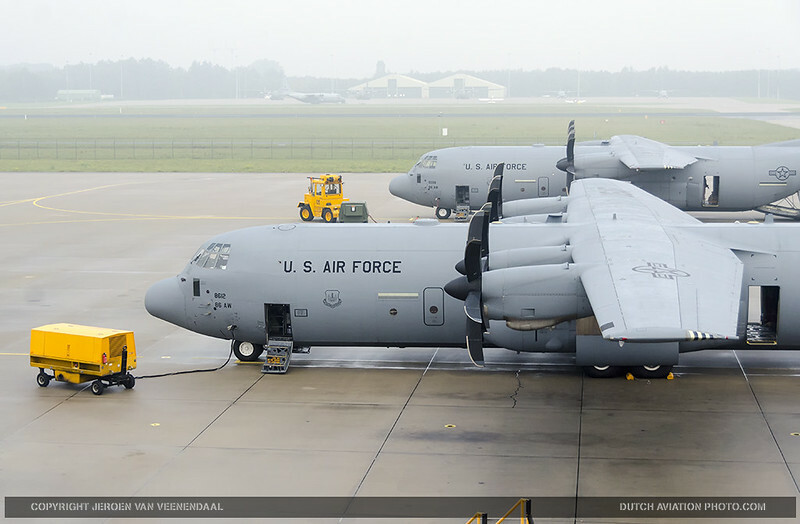 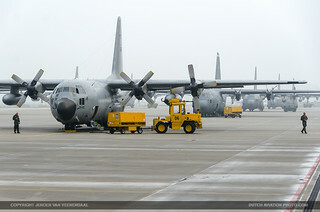 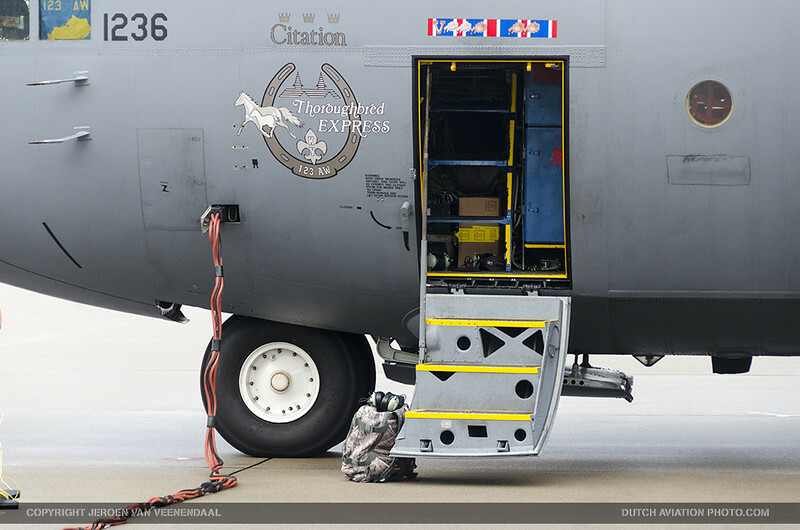 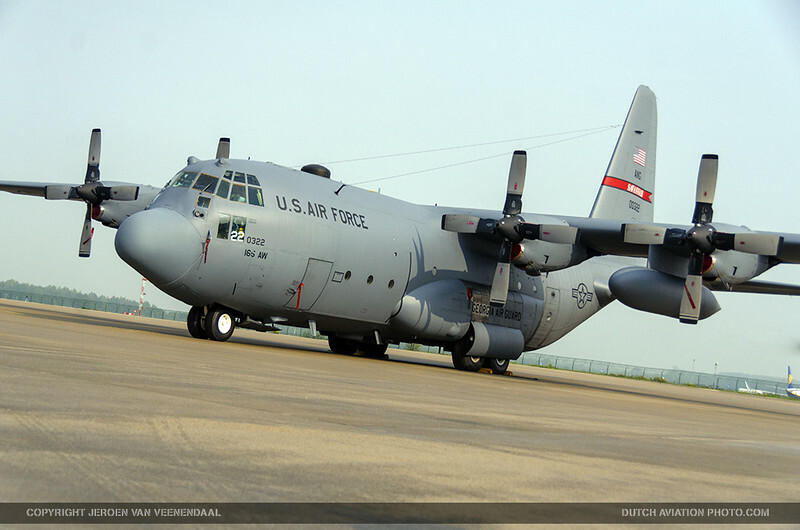 At Eindhoven AB we covered the annual mass takeoffs and landings of the transport aircraft supporting the para drops. Weather was very bad however, as you can see in our image set. 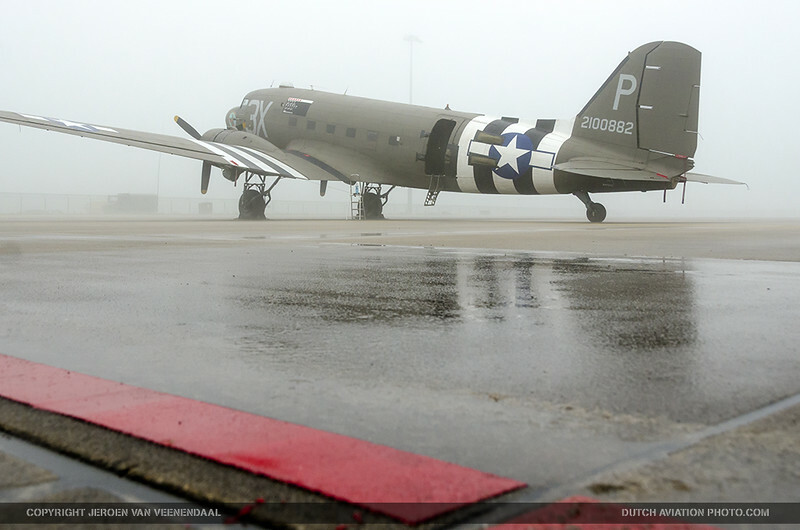 Therefore, the morning jumps over the Ginkelse Heide near Ede were cancelled due to heavy fog. Luckily in the afternoon the weather cleared enough for the C-10’s from Georgia and Kentucky Air National Guard to make a few runs. 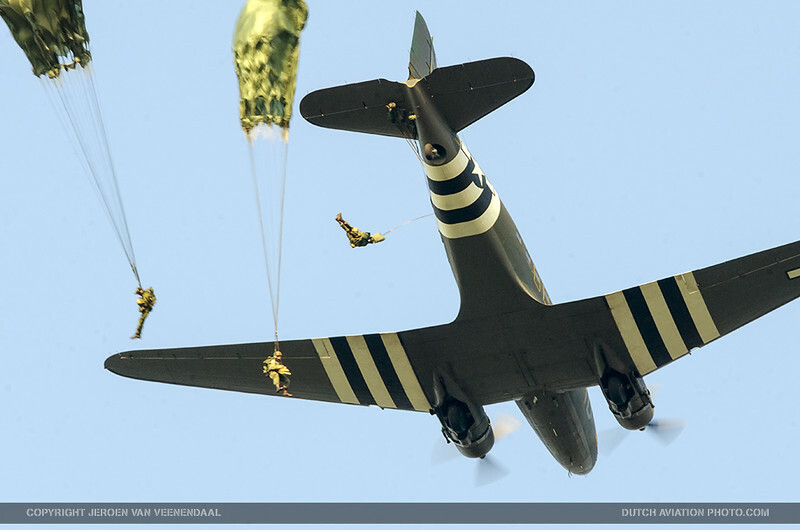 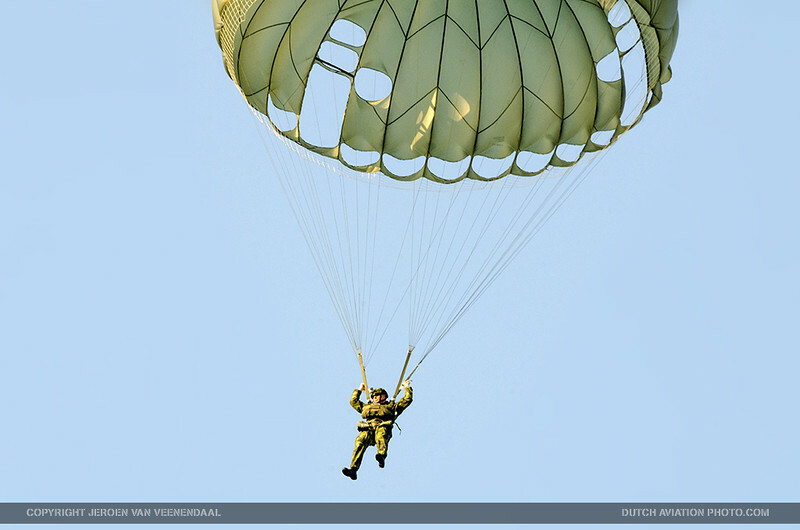 Around 60.000 spectators were at the Ginkelse Heide to watch the paratroopers jump.